It’s been proven that each person is capable of maintaining approximately 150 relationships in their lives without aid. 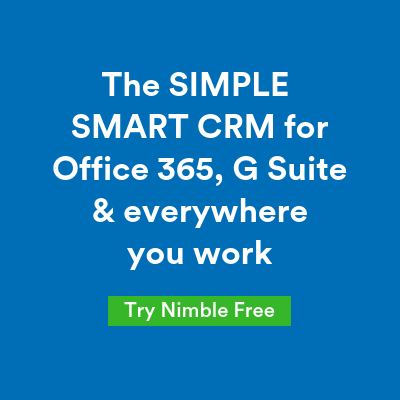 Therefore, the Nimble team has made it our duty to ensure you build, scale, and maintain as many relationships as possible with key people who are important to your business. 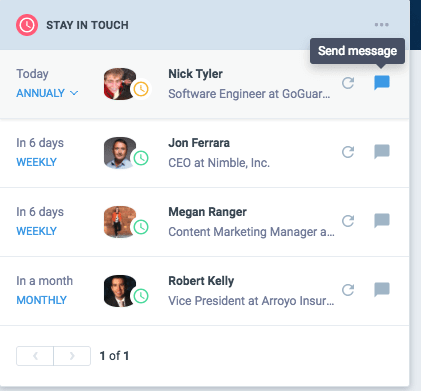 With our new Stay in Touch reminder widget, it’s easier than ever to cultivate and maintain relationships with thousands of contacts within your Nimble account. 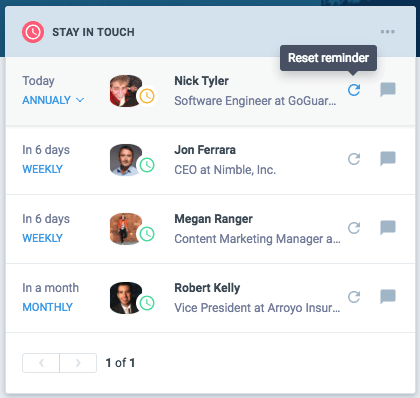 Stay in Touch reminders are demonstrated in weekly, monthly, quarterly, and annual intervals to help you make sure you’re connecting with contacts in the proper intervals. If you ever fall “out of touch” with someone, they’ll appear atop your Stay in Touch reminder list in Nimble! With the widget integrated into your Today Page dashboard, everyone you’ve fallen out of touch with will be top of mind. This enables you to know which connections require your immediate attention. Not ready to reach out yet? Simply hit the refresh button to reset and snooze the reminder! Learn how to get started on our FAQ page. Our Stay in Touch widget is one of many widgets available on our Today Page dashboard for all Nimble plans today! If you do not have a Nimble account yet, we invite you to try it for free for 14 days.